4 Bedroom Detached House For Sale in Helston for Guide Price £500,000. A delightful four bedroom Georgian farmhouse in the rural hamlet of Tregarne, approx. 1 mile from the coastal village of Porthallow. 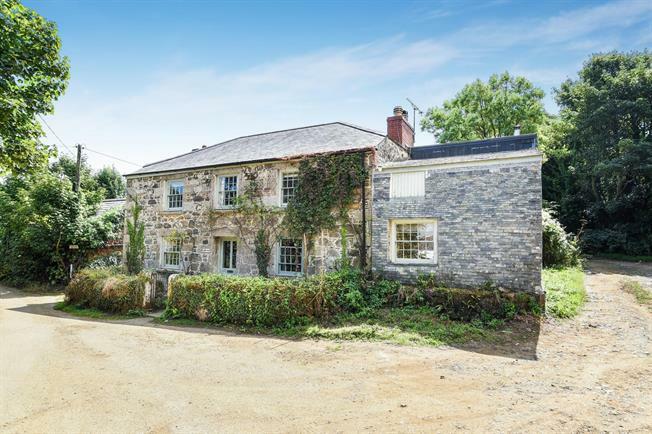 This wonderful Georgian farmhouse is located in the rural Hamlet of the Tregarne which is approximately 1 mile from the popular coastal village of Porthallow. The property has been substantially extended over the years and now provides extra accommodation and a further reception room. Careful consideration has been given to maintaining character features that one would expect for a traditional Cornish farm house while the alterations have made the property practical for modern living. The traditional central hallway bisects the original part of the property with the formal drawing room located on the left with recently restored multi paned sash windows and a central feature of an original fireplace with slate hearth. To the right of the hall was formally two rooms and now has been opened up to make one larger room spanning from the front to rear elevations and makes this fabulous room light and airy however with two distinct feels and uses at either end of the room. There is a granite Inglenook fireplace with the central feature of traditional wood burning stove towards the rear of this room with a further feature open fireplace in the snug/study end. Both ends of this expansive room again have recently refurbished multi pane sash windows. In the new part of the property on the ground floor are now a very impressive kitchen/dining room covering the depth of the house and measuring approximately 30 feet in length. Stripped wide timber floors are the full length of this bright triple aspect room. As one would expect in a farmhouse style kitchen and property of this character the Aga is the central feature of the kitchen and is surrounded by a range of base units crowned by timber worktops. The rear door off the kitchen leads to the rear garden while there is a staircase leading to the studio/bedroom five located directly above the kitchen dining room. This substantial room is very flexible in use and would make the ideal office or games room and even further accommodation for a master bedroom suite or overflow accommodation for guests. Completing the ground floor accommodation is a useful and separate utility room toward the rear of the property. Stairs off the hallway rise to the 1st floors spacious central landing in the original part of the property where there are four bedrooms and family bathroom. The bedrooms have charming features with the same aforementioned multi pane sash windows with most having quaint timber window seats adding to the character of the home. The family bathroom has a full-length bath and has a wonderful half panelled wall and is light and spacious with its window having a timber seat below looking over the rear garden. Externally to the property there is a substantial rear garden which is part divided towards the rear of the garden with a wonderful stone Moon Gate. Immediately of the rear of the property is a level patio area which offers a high degree of privacy and is an ideal area for alfresco dining. The garden is bordered by mature trees and hedging and is mostly laid to lawn and level therefore making it an ideal place for children to play. Tregarne Farmhouse is in the small hamlet of Tregarne which is approx. 1 miles The Village of Porthallow is located on the Lizard Peninsula one of the most picturesque parts of Cornwall close to some of the most stunning unspoilt beaches and creeks in the country. The village offers a range of local amenities and within a 3rd of a mile driving distance of the popular beaches of Porthallow, Gillan Cove, the nearby sandy beach of Coverack, plus the renowned Helford River, which alongside Falmouth Bay and the Fal Estuary, offers some of the finest tranquil sailing waters in the United Kingdom. The historic larger market town of Helston, approximately 13 miles away offers a variety of amenities, shops, cafes, restaurants, public houses and a cinema. The following services are available Mains electricity Mains water supply, private drainage, Oil central heating and telephone connection although we have not verified this. Council tax 'Band D'.